She has been to Daytona Beach only once before -- as a Spring Breaker in 1993. Now Alyssa Park is returning as a violinist with an established career and an enviable international reputation. She is scheduled to appear on the Peabody Auditorium stage at 8 p.m. Saturday to play the Brahms violin concerto with Vladimir Valek conducting the Czech Philharmonic. The concert is the second in the Daytona Beach Symphony Society season. 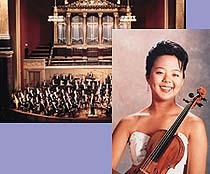 Instead of suntan lotion and a bathing suit, Park is bringing a Stradivarius that has been put at her disposal during her United States tour with the Czech orchestra. Her own instrument, she said during a telephone interview, is an old Italian violin bearing a Rocca label. "I doubt if I'll ever own a Strad," she said. "Bankers are buying them up for resale. They go for about $1 million." But even without her own Stradivarius, Alyssa Park has managed to play her way into early renown. At 16 (three years before her Daytona Beach visit) she won a bronze medal in the 1990 Tchaikovsky International Competition. The jury also judged her the most promising talent, most artistic performer, most interesting personality and most adept at handling her instrument. By 1990, Park had already made numerous appearances in this country after her professional debut at 11 with the Cincinnati Chamber Orchestra. Her New York debut performance in 1991 at Lincoln Center's Alice Tully Hall was praised by The New York Times for "unusually strong technique and a youthful sense of music making." Park made her European debut in 1991 with Sir Colin Davis and the Bavarian Radio Symphony Orchestra. Her first contact with the Czech Philharmonic, she said, was during the Brahms Festival in Madrid a couple of years ago. However, the upcoming concert will mark her first public appearance with conductor Vladimir Valek. Press releases make a point of Park's youth. Is she sensitive about her age? No, she said, readily admitting to 23. No wonder she's billed as the youngest faculty member at the Aspen Music Festival in Colorado, where, incidentally, she won a concerto competition. She lives in her hometown of Cincinnati and teaches in the Preparatory Division of the Cincinnati Conservatory of Music. As a performer/teacher, what does she like to emphasize in her teaching? "I think the main thing in teaching music has been lost -- the love of music," she said. "Teaching technique is important, of course, but it should be put in proper perspective. Too often we become narrow-minded in our approach to music. Musicians should broaden their interest in the arts, and learn to really love what they do." If students already have that love in their hearts, she added, so much the better. Concert tickets from $25 to $40 are available from 10 a.m. to 4 p.m. weekdays at the Symphony Society, 100 S. Beach St., Suite 200, Daytona Beach. Tickets also will be on sale Saturday at Peabody Auditorium, 600 Auditorium Blvd., starting at 10 a.m. For more information, call (904) 253-2901. Send questions, comments or Feedback to News-Journal Center.